St. James-Santee: In April 1923, Charleston Museum director Laura Bragg arranged a tour of the historic site for participants in the American Association of Museums conference held downtown that year. 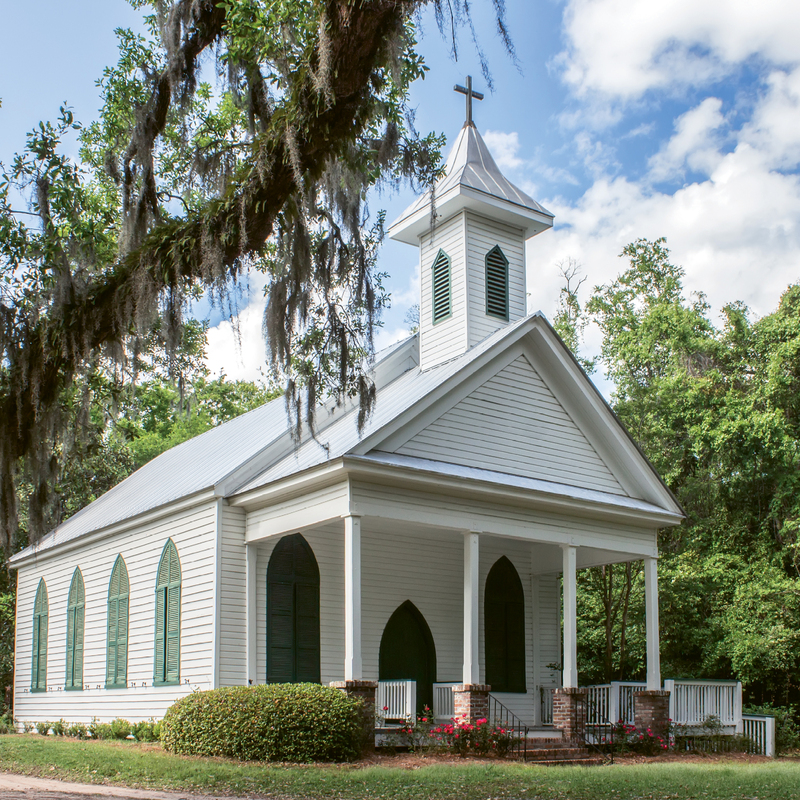 Built in 1890 of black cypress shingles, St. James’ Episcopal Church was originally the chapel-of-ease for the Brick Church at Wambaw and served Santee River planters who summered in McClellanville. In 1918, the roles reversed when the Brick Church was declared inactive and the chapel-of-ease became the parish’s main house of worship. Today, it remains an Episcopal church with regular Sunday services. St. James' Goose Creek: A wooden canopy known as the “sounding board” tops the pulpit to help project the minister’s voice. St. James' Goose Creek: Among the interior wall decorations is the funerary hatchment with the coat of arms of the Izard family. Following the English custom, after the head of a family was buried the panel was hung in the church. Strawberry Chapel: The letters of the arced inscription over the altar were formed with hundreds of small pine cones. St. Thomas Parish Church was listed in the National Register of Historic Places in 1977. 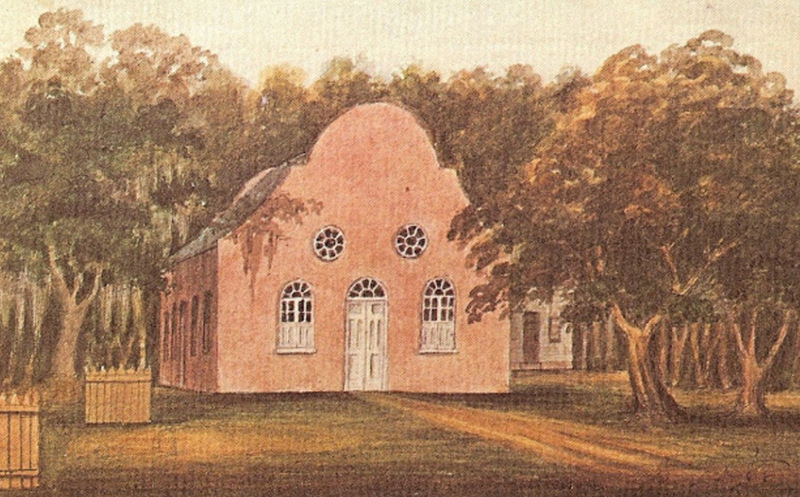 Christ Church near Snee Farm was established as the main house of worship for the parish East of the Cooper River. St. Andrew’s in the Old Village served as the chapel-of-ease for Christ Church congregants who lived or summered near the harbor. 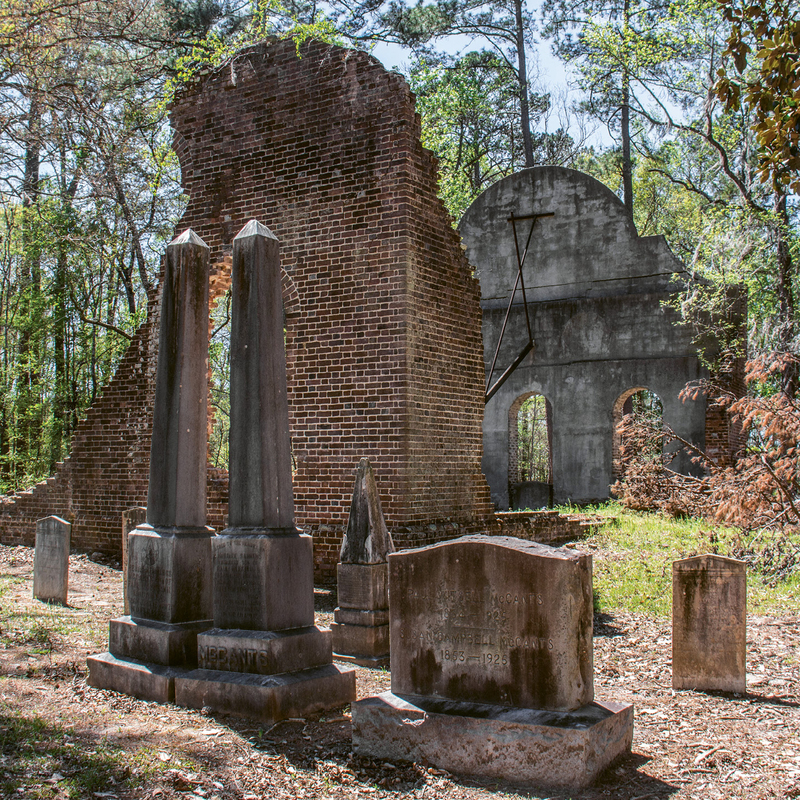 Pon Pon Chapel-of-Ease: Crumbling walls, part of a cistern, and a churchyard are all that remain of this chapel off Parkers Ferry Road, formerly a busy stagecoach road between Charleston and Savannah. Trinity Episcopal Church, Edisto Island: The cross on the steeple was given by Eldon D. Hunter in honor of his mother, Virginia Griffen Hunter (1869-1935). St. James-Santee Episcopal Church at Wambaw today; (inset) in April 1923, Charleston Museum director Laura Bragg arranged a tour of the historic site for participants in the American Association of Museums conference held downtown that year. Charleston has long been known as the “Holy City” for the graceful steeples that shape its skyline. Yet, beyond the peninsula lies a trove of exquisite parish churches and chapels, some of the oldest extant buildings in the country. 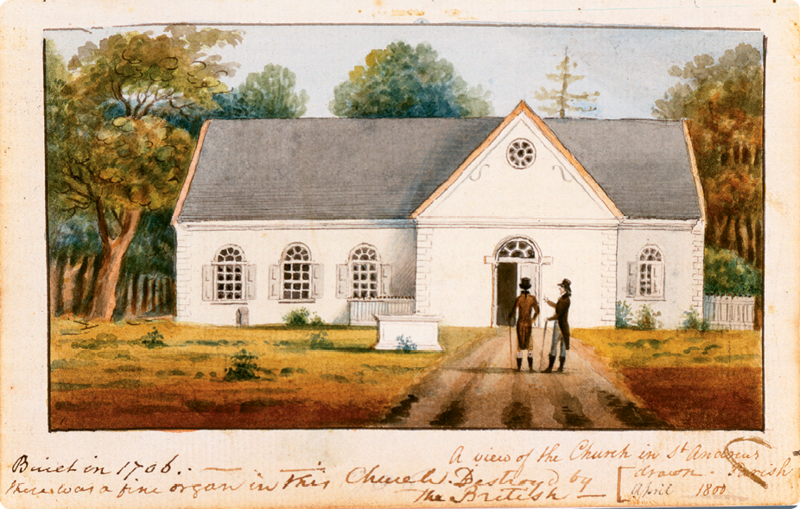 Their beginnings date to the Church Act of 1706, which established the Anglican Church of England as the colony’s official religion and created 10 separate parishes, each with its own church and “chapel-of-ease,” a smaller, satellite house of worship erected to serve congregants living in more remote areas. Despite three centuries and the ravages of war and nature, an astounding number of these houses of worship have survived. Some only hold services once or twice a year, others continue with dynamic congregations and regular Sunday services. All represent a wealth of architectural, cultural, and historical importance. 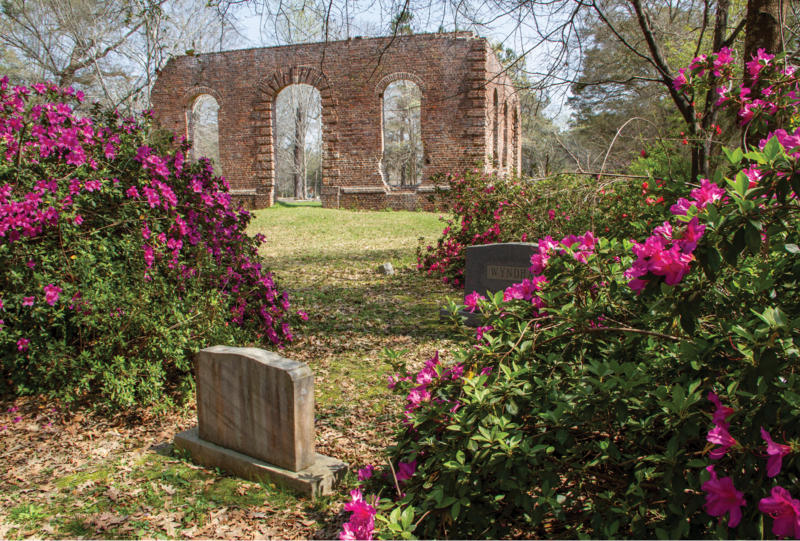 Journey with us—from Old Brick Church in McClellanville, to the treasured chapels along the Cooper River, to the burned-out ruins of Pon Pon and Biggin—and explore these fascinating portals to the past. Driving the Old King’s Highway is best done unhurriedly, at the slow and steady horse-hoofed clip-clop of its 17th-century origins. The forgotten dirt byway today is pocked with ruts and dips and bordered by endless green woods. There’s not a telephone pole for miles—not one trace of the modern world in view. Every rotation of the car wheels takes travelers back in time. 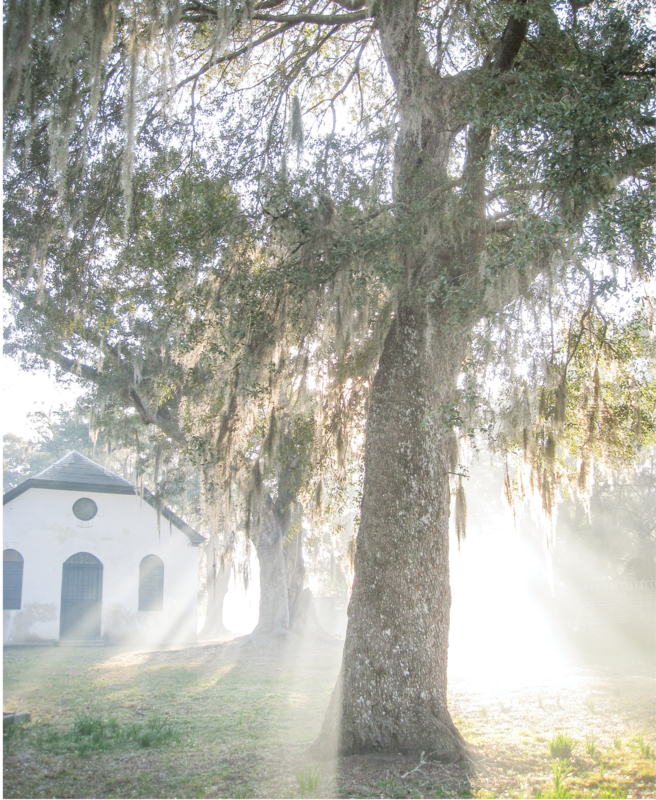 Ahead in a clearing, standing in muted elegance is the old Brick Church, the parish center for St. James-Santee. 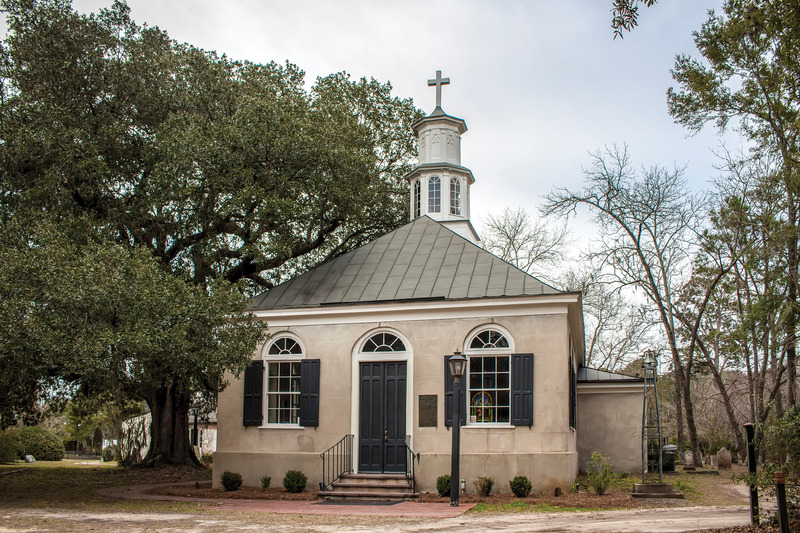 Its tall, brick-pillared portico and white Palladian doors invite the same formal welcome to prayer as when the church was built 250 years ago, only those who knelt in its pews in 1768 now rest peacefully in the churchyard outside. 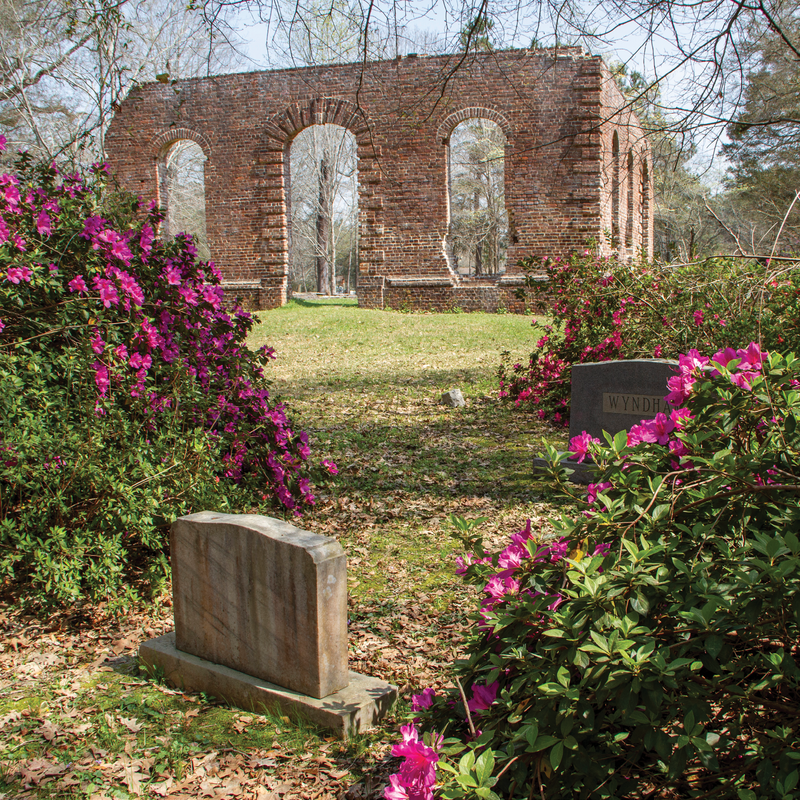 Like other parish churches, Brick Church suffered after the Civil War when most of the congregation moved from their Santee River plantations. 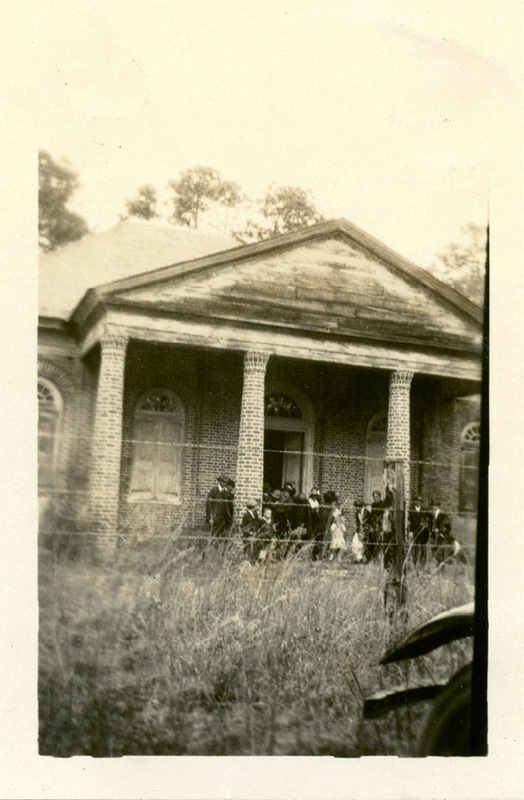 By 1918, only an annual service was being held, and the chapel-of-ease in McClellanville (pictured below) became the parish church. For more information and images, visit the SC Picture Project. 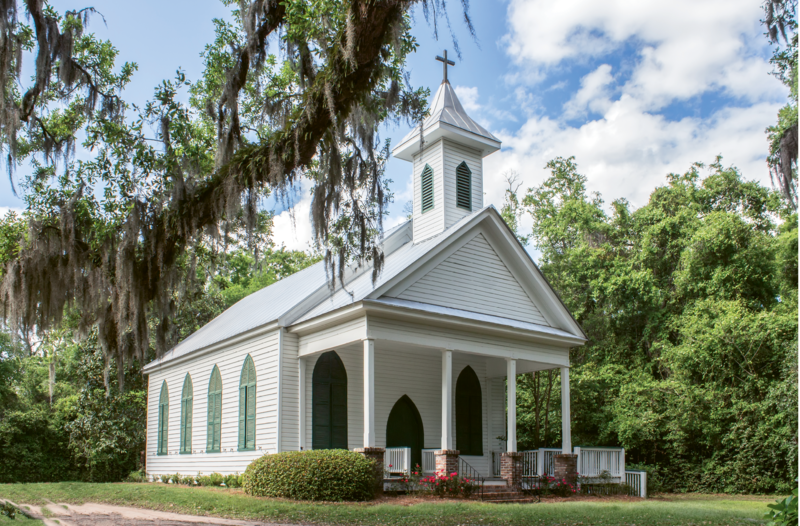 On busy Ashley River Road lies the oldest extant church building south of Virginia. 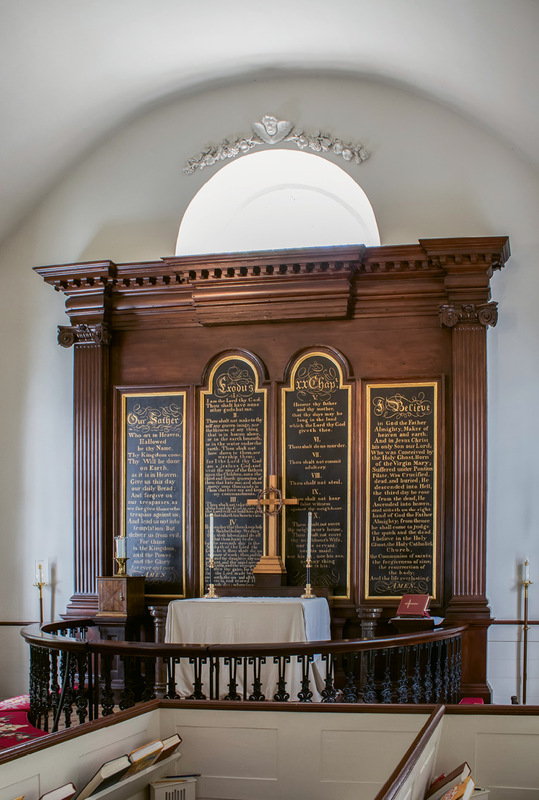 “It shares the birth year of one of our oldest founding fathers, Benjamin Franklin, and predates iconic Old North Church in Boston and Bruton Parish Church in Williamsburg,” notes parish historian Paul Porwall. The first church, a small rectangular wooden structure, was enlarged in 1723, creating the present cruciform, or cross-shaped, floor plan. A main entrance, called the “great door,” faced the river and welcomed the gentry; the “small door” on the west side was used by commoners, servants, slaves, and clergy. While the British occupied the church and grounds during the American Revolution, only the parsonage was burned. 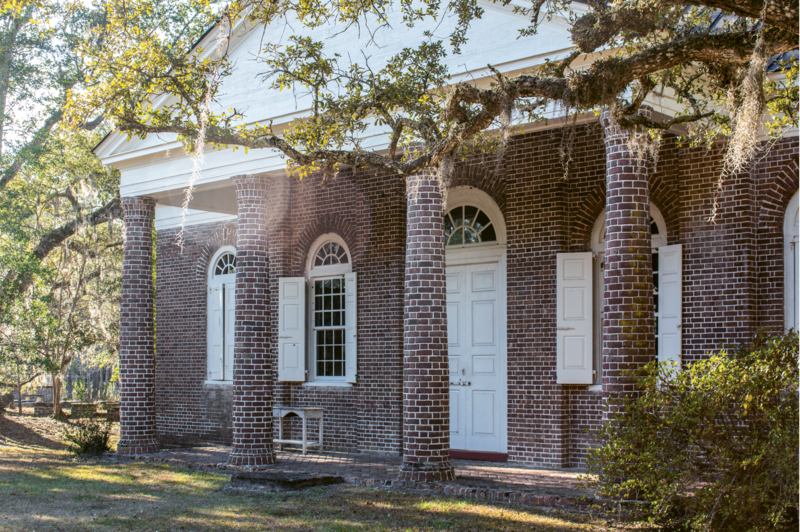 Similarly, although Union troops set fire to every plantation along the Ashley River save Drayton Hall, the sanctuary was remarkably untouched by the Civil War. 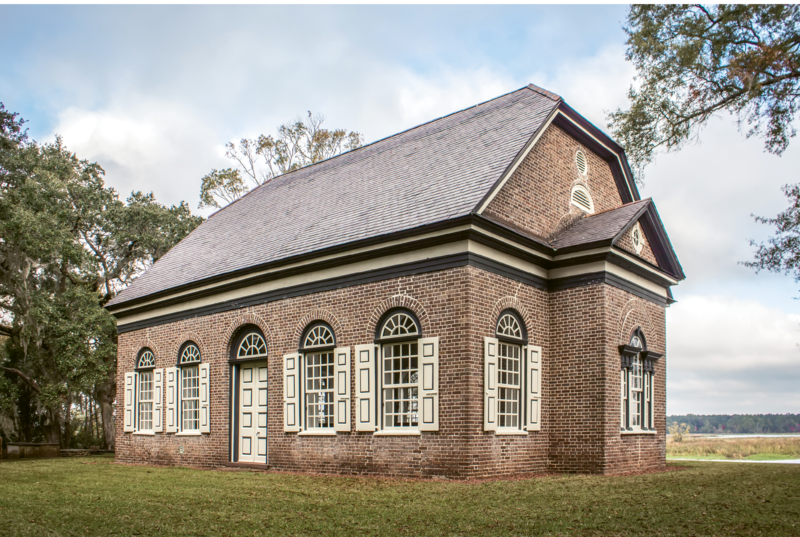 This second oldest church building in South Carolina originally served the wealthy Barbadian planters (“Goose Creek Men”) and their families. Perhaps the most elaborately adorned of all the parish churches, the Georgian brick edifice, covered in stucco, is graced by tall, arched windows and a distinctive jerkinhead, or half-hipped roof. Of particular merit is the carved plasterwork above the main entrance doors. The entablature holds a row of five carved flaming hearts, recalling the passage in Luke 24:32, “Did not our hearts burn,” when the disciples met Christ on the road to Emmaus. Above, in the triangular pediment, the “pelican in piety” evokes the legend of the pelican who pierces her breast to feed her young with her own blood, thus symbolizing Christ’s sacrifice upon the cross. Over each of the arched windows are carvings of winged cherub heads. Among the interior wall ornamentations and framed by tall, Corinthian pilasters are the coat of arms of King George I, which, according to tradition, kept the British from burning the church during the Revolutionary War. 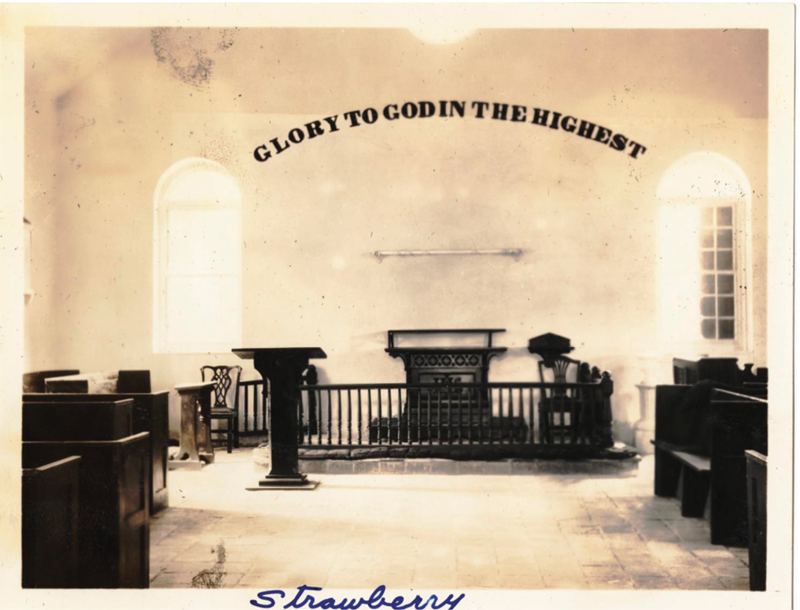 Strawberry Chapel is the only remaining trace of Childsbury Town, a thriving community established in 1706 by colonist James Child adjoining his Strawberry Plantation, hence the chapel’s name. In the early 1700s, Childsbury was the “frontier,” a major Native American trading post with a busy ferry that crossed the Cooper River to Goose Creek. The town ultimately became an important market center, with homes, shops, a school, and the requisite tavern. For reasons still uncertain, the town ceased to exist before the turn of the 19th century. 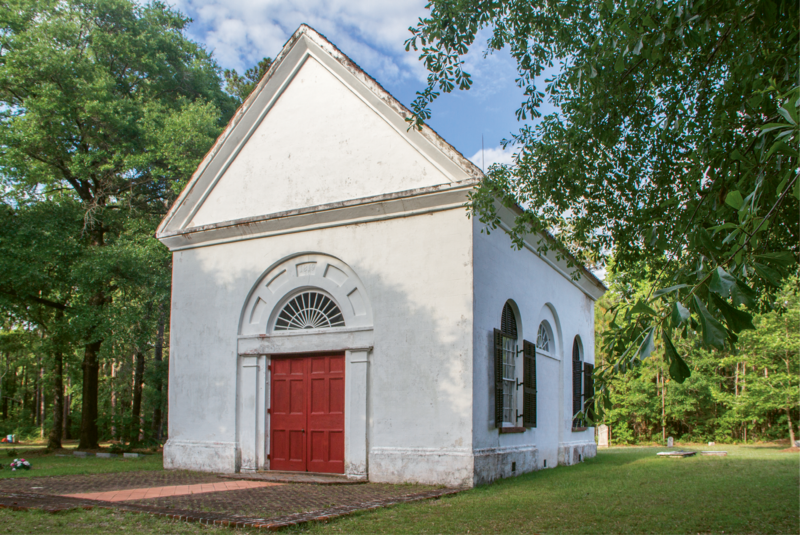 Similar in plan to St. James’ Goose Creek, with a jerkinhead roof and stuccoed exterior, Strawberry was originally established as the chapel-of-ease for St. John’s Berkeley Parish, also known as Biggin Church (opposite), to serve the rice planters along the Cooper River’s West Branch. With understated architectural elegance, doors open on the north, south, and west sides; bull’s-eye windows ornament both gable ends. While the building is now stuccoed, the under bricks are laid in Flemish bond with tooled mortar joints, suggesting that the brickwork was originally exposed. The parish church for St. John’s, Berkeley, was built in 1712 on three acres donated by Landgrave John Colleton at the head of Cooper River between Wadboo and Biggin creeks, hence the name, Biggin Church. Fire destroyed the first wooden structure in 1755. Rebuilt in 1763 in brick, the building was used by the British as a depot for supplies during the American Revolution, after which they set it afire. Rebuilt again, the church fell into ruins after the Civil War. By 1899, the northern and eastern walls had crumbled, and Strawberry Chapel became the parish church. The church was listed in the National Register of Historic Places in 1977. Status: Inactive; Episcopal Diocese of South Carolina. 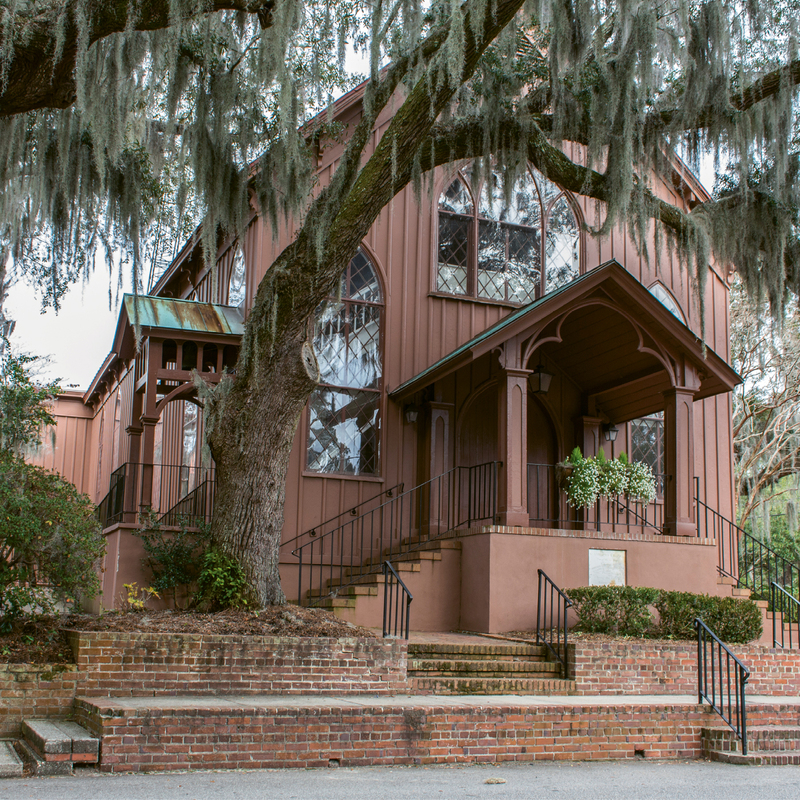 The property, now a mission church of The Church of the Holy Cross on Sullivan’s Island, is open only on special occasions. Buried in the churchyard is wealthy colonist Richard Beresford who, after his accidental death in 1721 “from a falling tree limb,” left one-third of his sizeable estate for the establishment of a free school in St. Thomas Parish. The trust, called the “Beresford Bounty,” has remained active for almost 300 years, the funds now earmarked for the upkeep of the church and grounds. 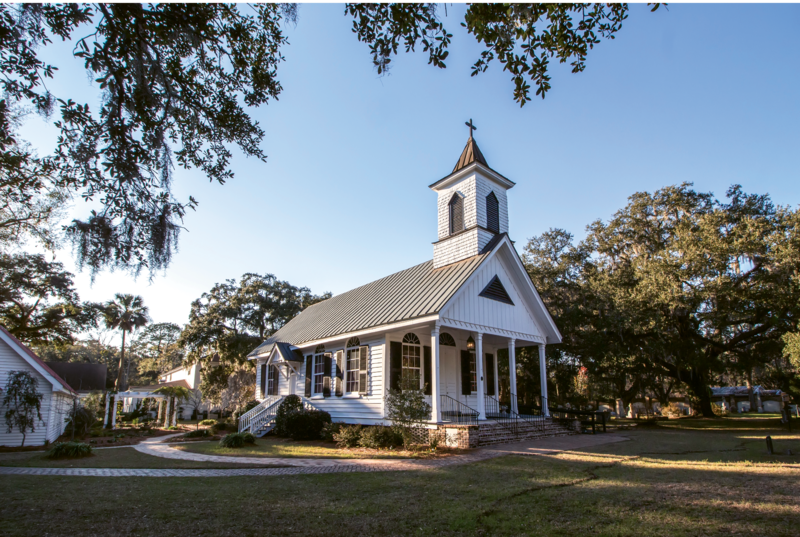 Since 1957, St. Thomas has been a mission church under the auspices of the Church of the Holy Cross on Sullivan’s Island. The layout follows the typical colonial rectangular plan, topped with a jerkinhead slate roof. 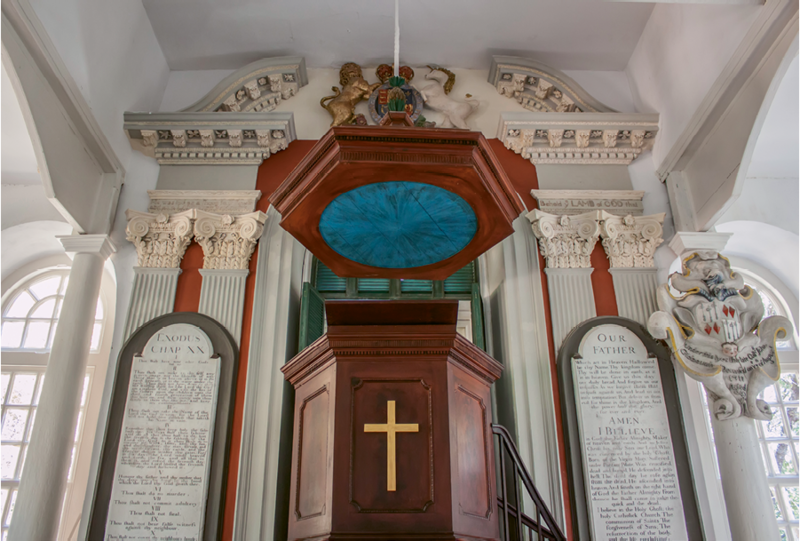 The interior, however, differs in that the pulpit is at the western, or vestry end, and the communion chancel is at the eastern end and backed by a tall Palladian window. Between, are pews arranged facing each other across a center aisle. 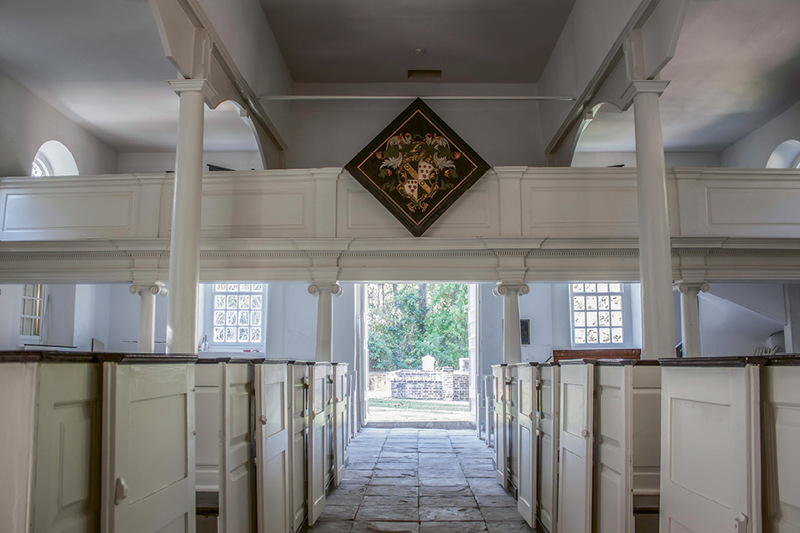 Pews on the west side were painted white, supposedly to designate where the white parishioners sat; those on the east painted brown to indicate the seats of the slaves. The floor tiles were given by wealthy merchant Gabriel Manigault who, at the time, owned nearby Silk Hope Plantation. 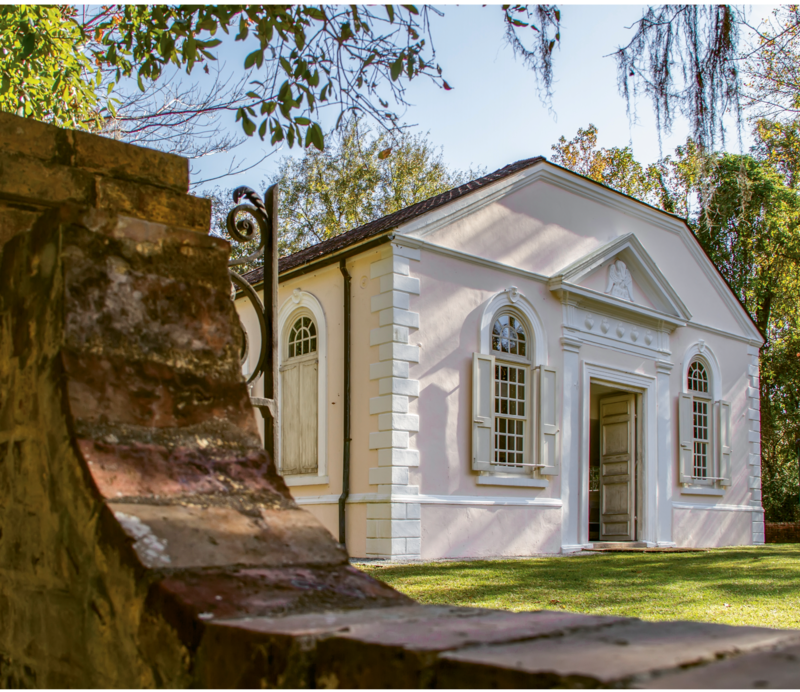 Construction is attributed to Charleston master cabinetmaker William Axson, Jr. and brickmaker Zachariah Villepontoux. Both have their initials carved on the structure. The interior woodwork and furnishings are all original. Recent renovations have remedied foundation issues caused by unsettled ground, moisture, and stress on the masonry walls from the slate, which was placed on the roof in 1840. 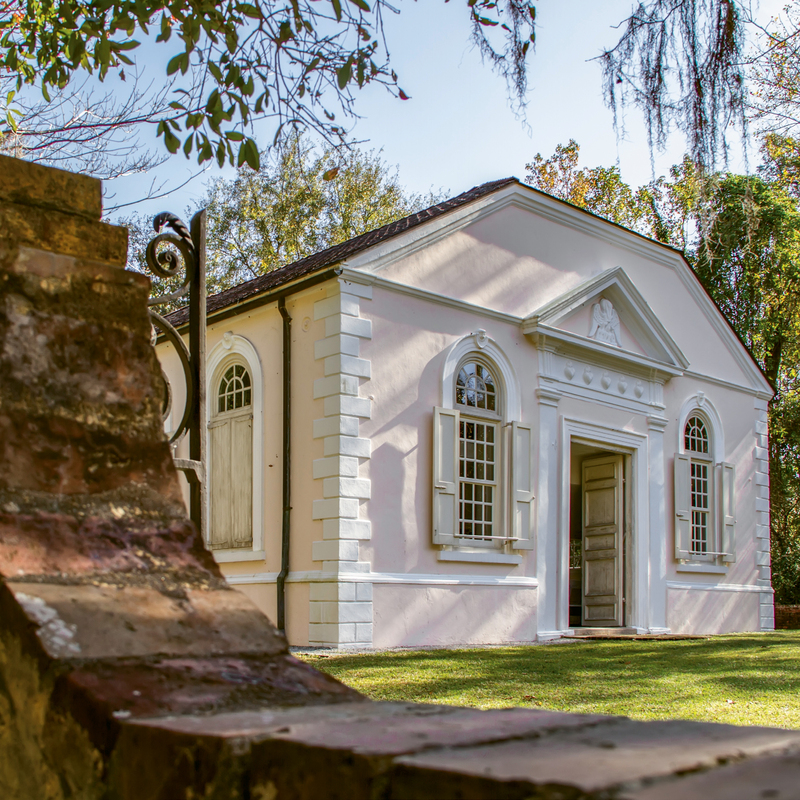 More than $500,000 was raised through the chapel’s foundation to meticulously restore the building to its original condition, with experts performing paint analyses to ensure that the woodwork matched the original 18th-century colors. When Christ Church Parish was established in 1706, there was no town of Mount Pleasant. Only farms and plantations dotted the lands on the east side of the Cooper River, then known as “Wando Neck.” Boats provided transportation along the Wando River and up Shem Creek. There was only one main “road,” the Old King’s Highway (later known as the “Georgetown Stage Route”), upon which today’s Highway 17 North was laid out. 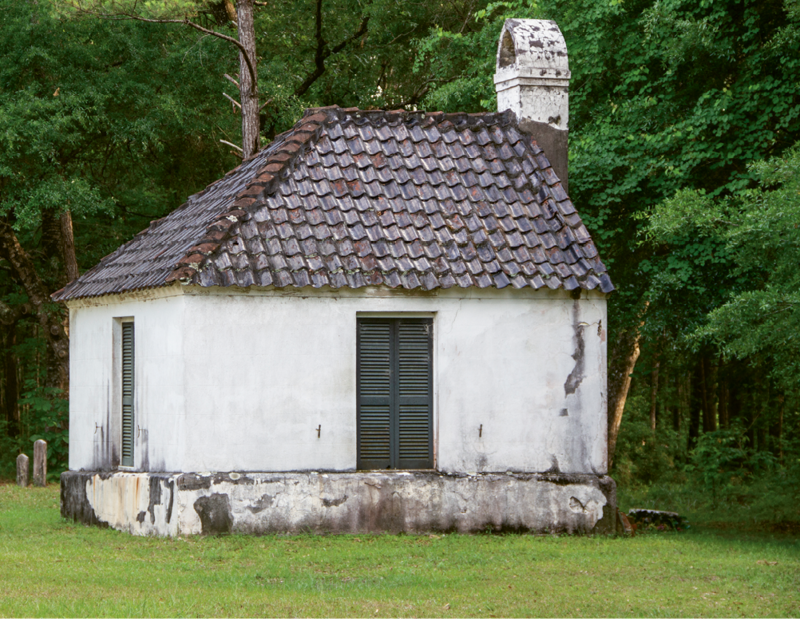 Two years later, the first church, a small timber structure, was built by vestryman and carpenter David Maybank of Hobcaw Plantation (today’s I’On). An accidental fire destroyed this building in 1725, and a brick church replaced it shortly thereafter. 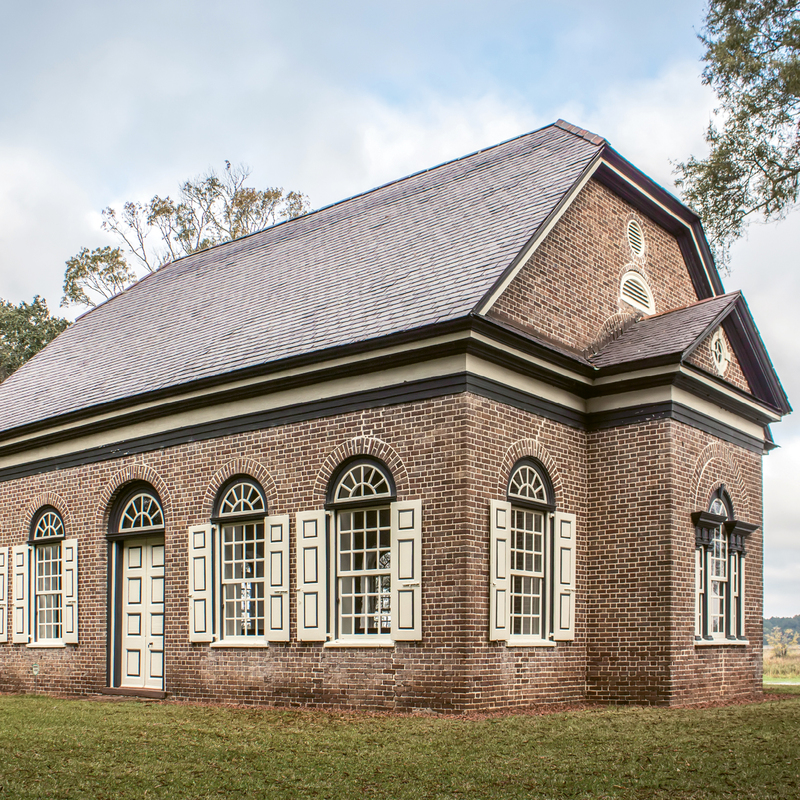 This edifice lasted until 1782, when British troops marching north after losing possession of Charleston purposely torched the sanctuary, burning it to the ground. In 1788, the present church was built on its foundation. By this time, more than 100 families resided or had plantations in the parish, many of whom would become historically important. 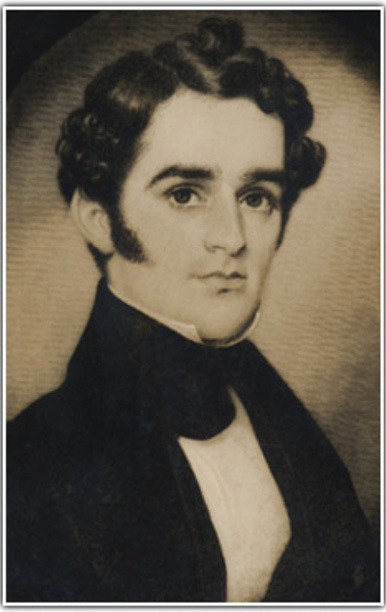 Two signers of the Declaration of Independence, Thomas Lynch, Jr. and Edward Rutledge, are among the many notables buried in the churchyard, as is Charles Pinckney of nearby Snee Farm, a signer of the Constitution. The church again suffered during the Civil War when Federal troops using the sanctuary as a stable for their horses burned most of the interior for firewood, including the pulpit, doors, windows, and pews. It wasn’t until 1874 that the church was restored. Christ Church remains an active, growing Episcopal church. In 1996, a larger sanctuary was erected behind the historic church, which is now used for special services and early communion on Sunday and Wednesday mornings. St. Andrew’s in the Old Village served as the chapel-of-ease for congregants who lived or summered near the harbor. 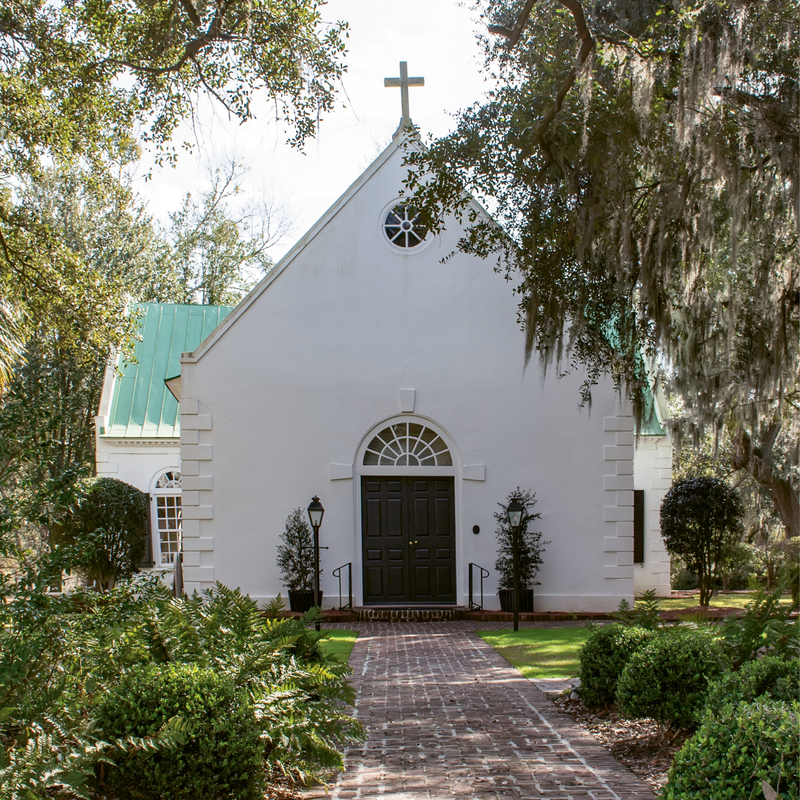 Located in the heart of Mount Pleasant’s Old Village, St. Andrew’s originated as a chapel-of-ease for Christ Church to serve Wando Neck planters who had summer cottages on the harbor. 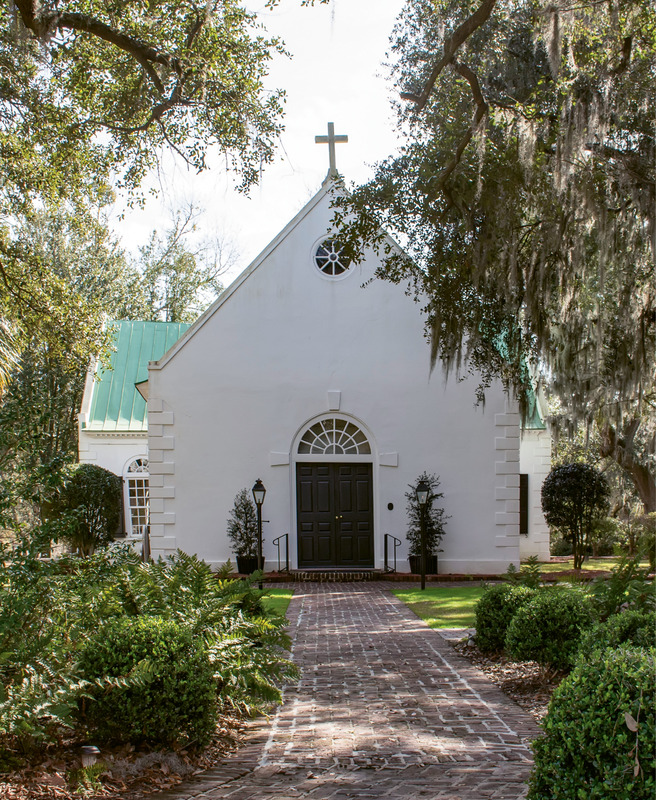 The first chapel was built in 1835; it was replaced in 1857 by the present Gothic Revival edifice designed by Edward Brickell White (also architect of Charleston’s French Huguenot Church). St. Andrew’s became its own parish in 1954 and remains an active church, now affiliated with the Anglican Church. Last year, when a fire burned the adjoining Ministry Center to the ground, the historic church suffered no damage. 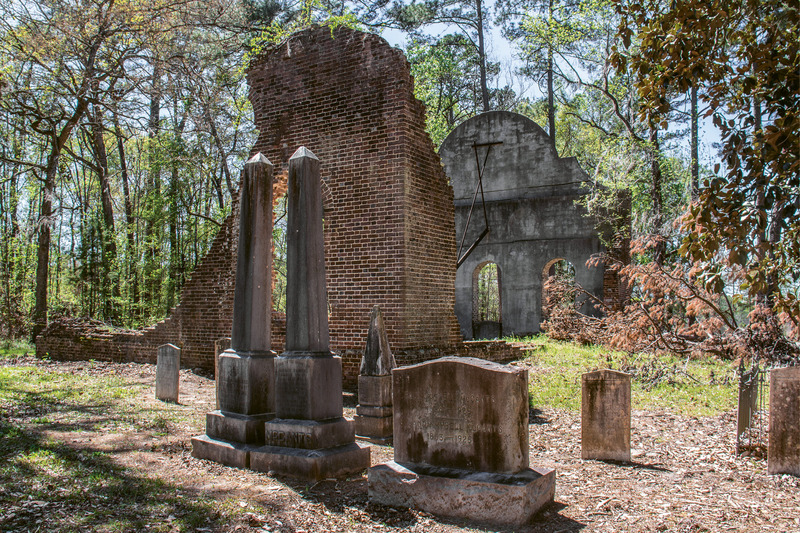 Crumbling walls, part of a cistern, and a churchyard are all that remain of this chapel-of-ease off Parkers Ferry Road, formerly a busy stagecoach road between Charleston and Savannah. 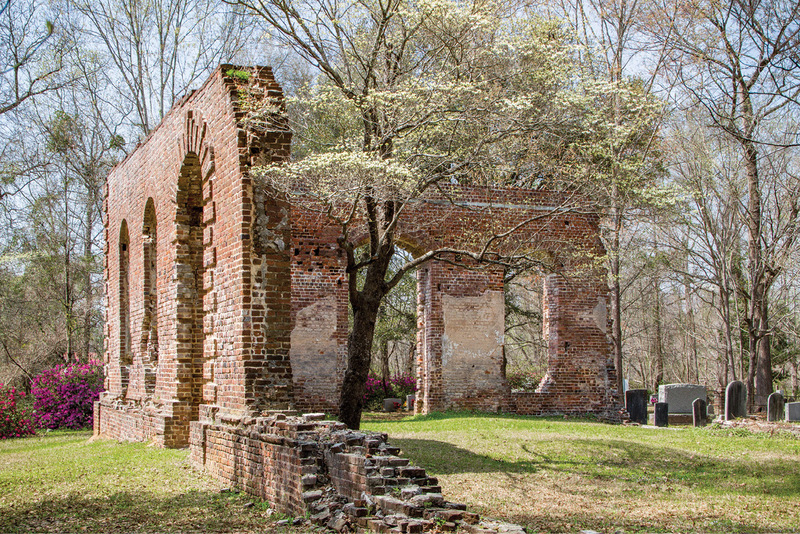 When this brick chapel-of-ease in St. Bartholomew’s Parish (now Colleton County) burned circa 1801, it became colloquially known as “Burnt Church.” Rebuilt between 1819 and 1822, the structure’s central entrance was flanked by windows designed with semicircular arches; the brick walls were laid in Flemish bond. Use of the chapel continued until 1832, when it was again reduced to ruins. Hurricane Gracie toppled much of the remaining structure in 1959; recent hurricanes have destabilized much of what’s left. 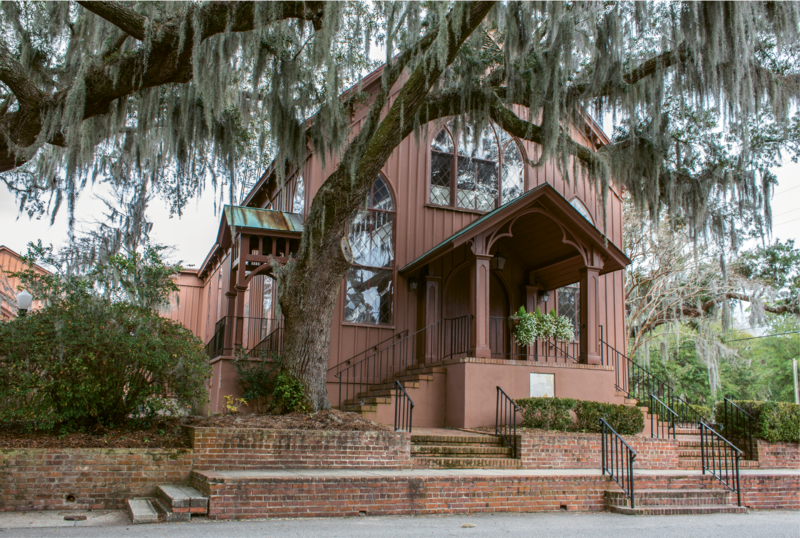 It is now owned and protected under the auspices of the Colleton County Historical and Preservation Society. 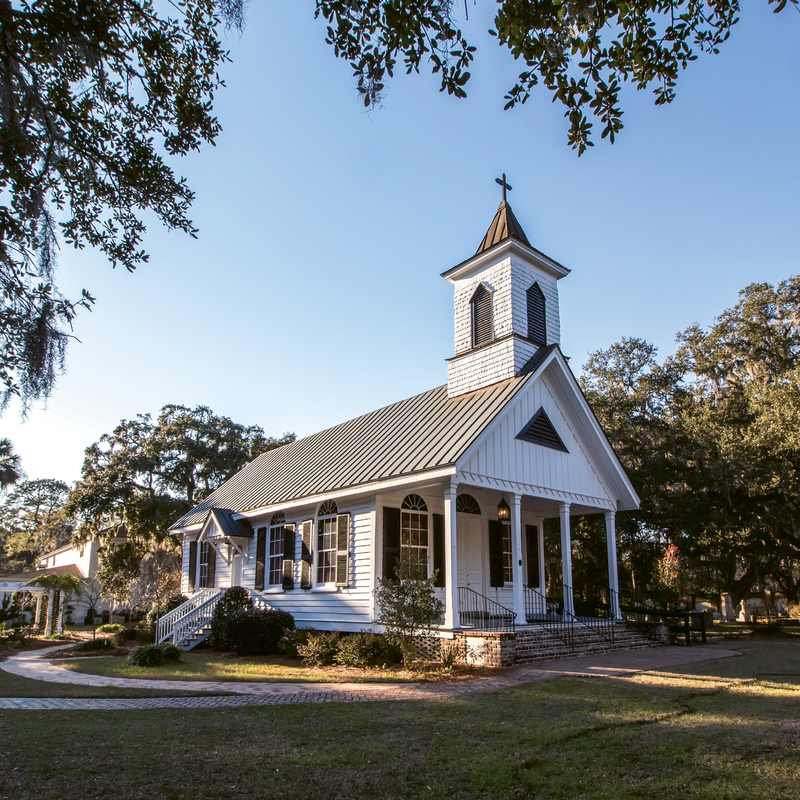 Trinity Episcopal was established in 1774 as a chapel-of-ease for St. Paul’s Parish to serve Edisto Island cotton planters. 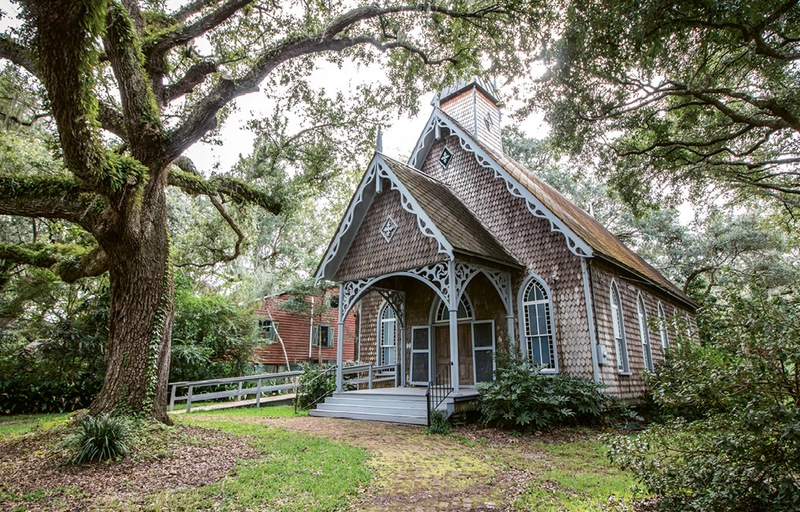 The current one-story wooden meeting house—the only example of Victorian church architecture on Edisto Island—dates to 1880. It replaced an earlier church, built in the 1840s, which was destroyed by fire in 1876. Trinity Episcopal remains an active church, now affiliated with the Anglican Church. 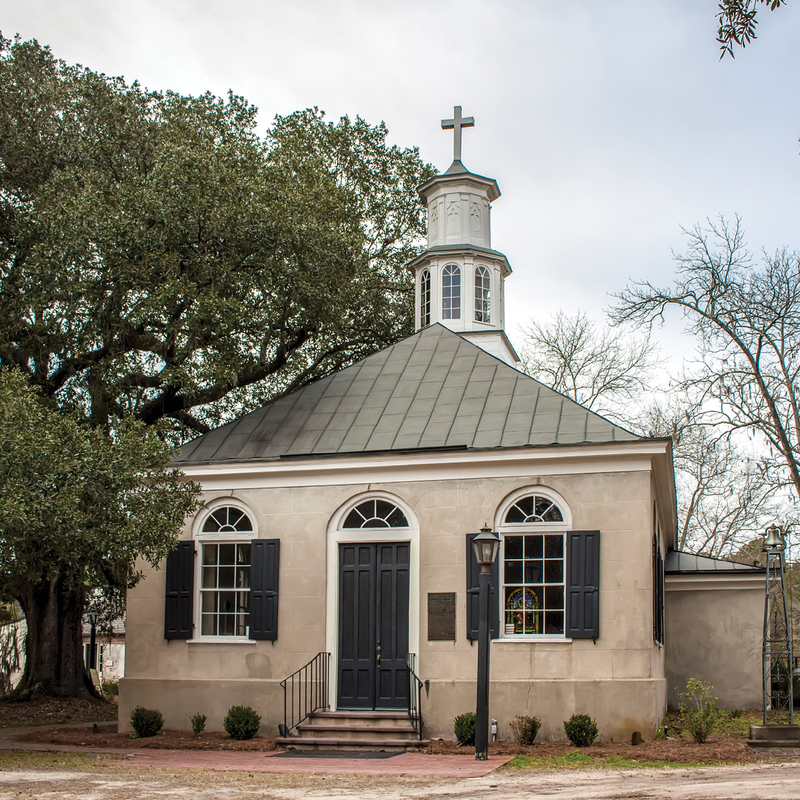 Sullivan’s Island’s first Episcopal church, Grace Chapel, was erected in 1813 for families who spent the summers on the barrier island. 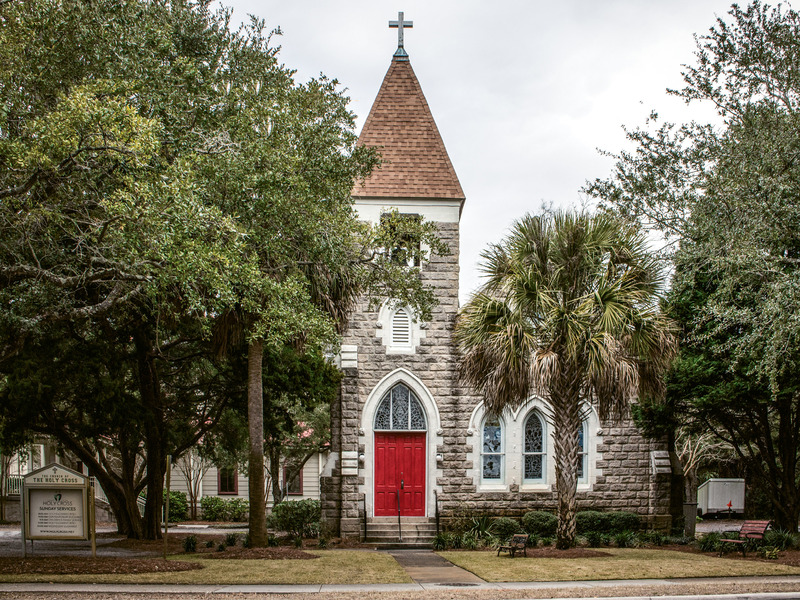 Its original location, almost directly behind Fort Moultrie, caused it to endure severe damage by shelling during the Civil War, and by 1879, the church was declared inactive. 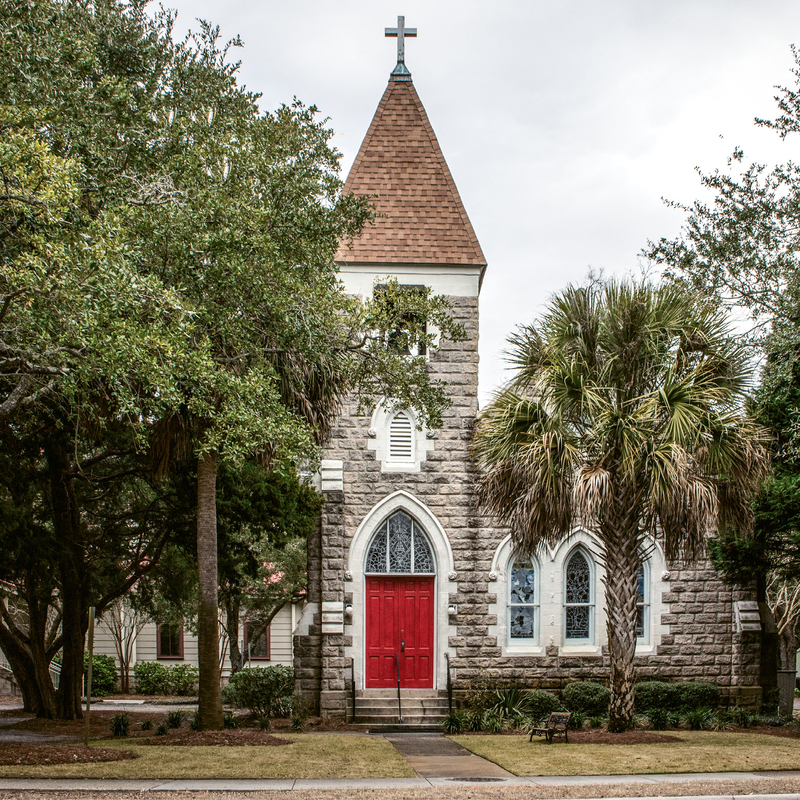 In 1905, a new building was erected one block east of Fort Moultrie and given the name Church of the Holy Cross. Two years later, expansions at Fort Moultrie required the congregation’s removal to a new site. An identical edifice was built near Station 24, the Church of the Holy Cross that continues to serve the island today. 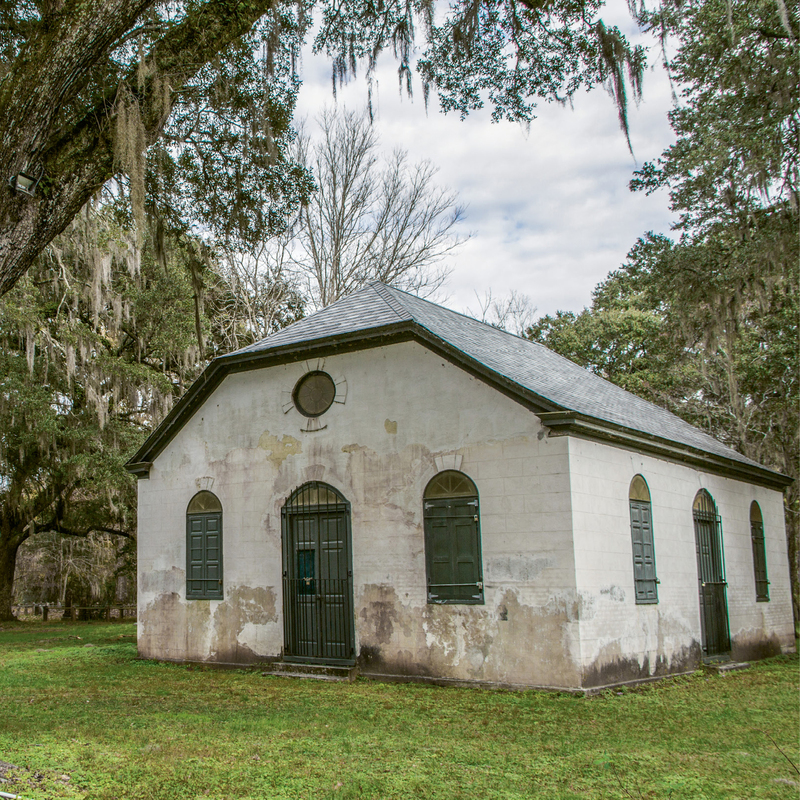 The original church building served as the post chapel until Fort Moultrie was decommissioned in 1947. It is now a private residence. 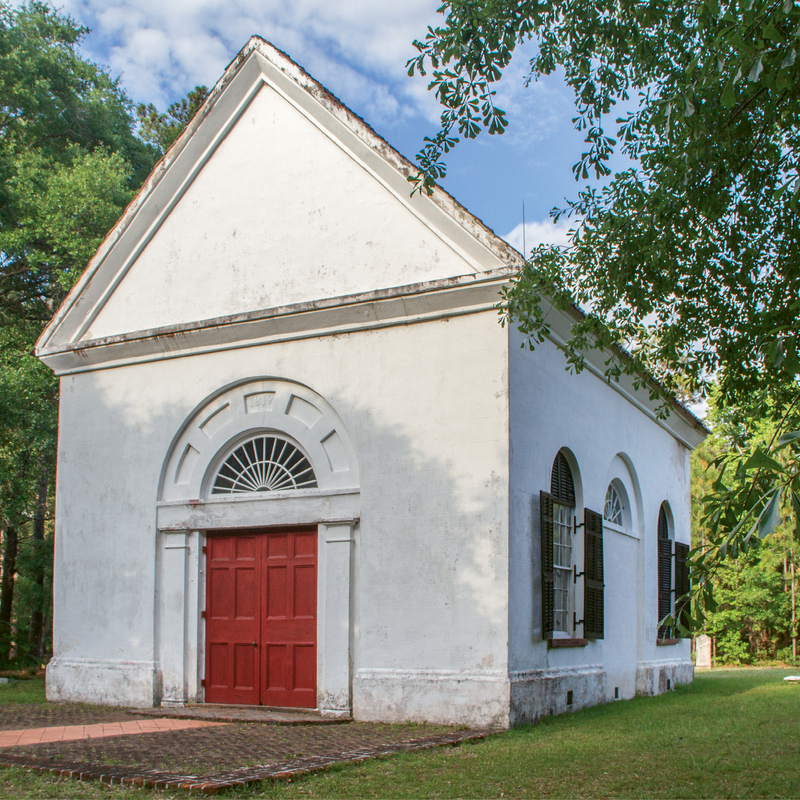 Originally called the “Church on the Rock,” Grace served the Wadmalaw Island planter families who summered in the village of Rockville on Bohicket Creek. 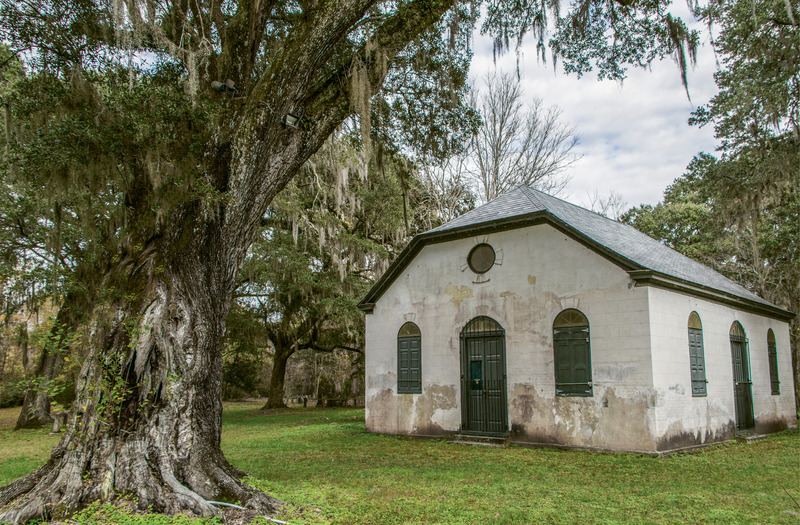 The building was spared during the Civil War; however the parish’s main church, St. John’s, was destroyed by fire, as was a similar chapel-of-ease at the summer community of Legareville on John’s Island. The church was moved to its present location in 1884; the chancel (the area around the altar reserved for the clergy and choir) was added in 1890. Following the great hurricane of 1893, the chapel was used by the American Red Cross and founder Clara Barton, as a center for recovery efforts. The chapel operates under the aegis of St. John’s Parish Church and holds regular Sunday services during the summer months.